All interest session rooms will be set theater-style. Peer-to-peer session rooms will be set in rounds. All rooms will have microphones, a screen, and a projector. Please note that presenters must supply their own laptop. Sessions may be recorded and available for live streaming and/or on-demand viewing at an additional cost to in-person and off-site registrants. Speakers must combine their presentations into one PDF of handouts prior to uploading. Handouts will be included on the Conference app with their corresponding session(s), and indexed on the NASFAA Conference Microsite. The deadline to upload your handouts is June 10, 2019. Presentations must use the 2019 NASFAA National Conference Slideshow Template. Presentations should be saved as Handouts with at least 2 slides per page. Handouts must be saved as an Adobe PDF (.pdf) prior to uploading. Handouts must be renamed using the following format: Session_Title_Keywords_NASFAA19.pdf. 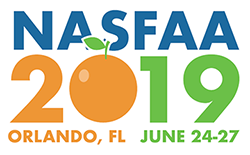 Summarize the session title with 3-5 words or a short phrase followed by _NASFAA19. They should include words within the title of the session, but do not need to exactly match, especially if the title is long. Try to choose words or a phrase that may be unique to the presentation. The file names will display within the Conference app, and when they are downloaded, so a descriptive name is an important step to help attendees find your handouts before and after download. Handouts must be smaller than 6 MB. If your handouts are over 6 MB, follow these tips to reduce the size. Upload your handouts via the Speakers Corner by June 10, 2019.